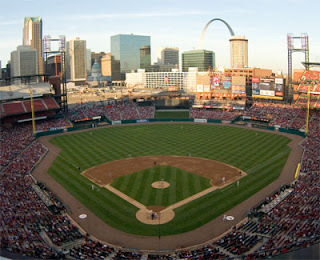 St. Louis is a baseball town. I never knew a line up, followed stats, or cared to go to a game until we lived here. Many can tell you where they were the day Kennedy was shot, or more recently on 9/11. But can you say where you were when Mark McGwire broke the home run record? Or the day Jack Buck died? Here is just a tiny taste of opening day festivities. Of course this was a MUCH warmer and sunnier opening day than the one that will occur today most likely. Though the white snow is a nice contrast against the green grass. Not only does baseball say spring but so do butterflies and bright colors. So this is what I will be stitching on while watching the ballgame this afternoon. Only a few more rows to smock. I am using the plate Ellen's Watercolors from the last (::sniff::) issue of Creative Needle. Not real sure why this looks so rippled in the picture, its not in real life. Since hanging onto the magazine while stitching the project is a pain, I just scanned in the plate and picture, made it into one page and printed that buddy off. 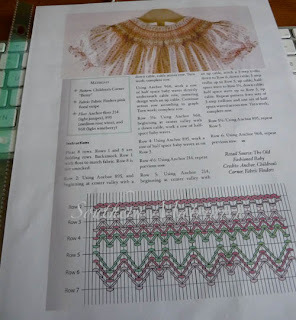 I put it in a page protector like I do the rest of my smocking plates. When finished I will just store this with my other plates in a 3 ring binder. What pretty spring butterfly fabric. Your smocking looks great!! What a beautiful plate! Your smocking is just perfect. Seriously what kind of closer gives away 4 runs in the ninth, when we are winning? It's sad, he makes Isringhausen look great on his best day! A delicious piece of fabric!!! I always love your beautiful smocking!!! Okay, I have checked a couple of times to determine what "Creative Needle's" status was. I could go to their website, but there wasn't any announcement or info, pertaining to whether they were still in business or not. Now I know they haven't published anything in the past few months (Dec?) but I don't understand them not making some sort of statement. Is this plate from the Dec issue? 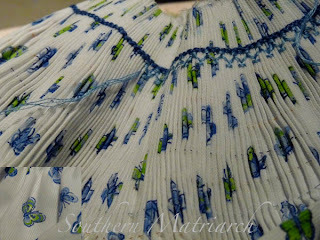 Don't get me wrong, I'm sad to see any, and especially anything to do with smocking/heirloom sewing go out of business.